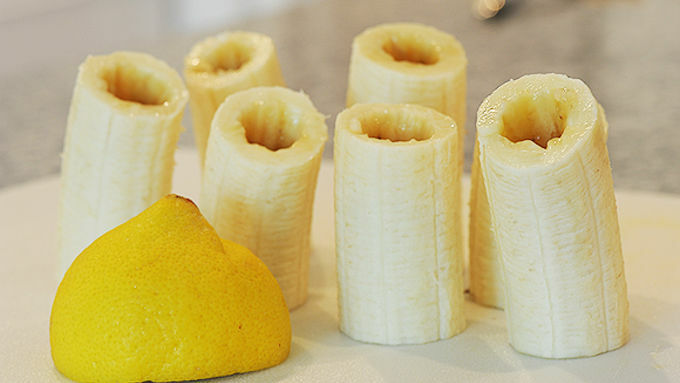 Peel the banana, slice off the ends and cut into two sections. Then hollow out the middle of the banana. Melt the white chocolate chips, or candy melts, in the microwave. Set the timer for short increments, no longer than 20 seconds, and stir after each heating. Repeat as needed until smooth and dunkable. Now it's assembly time. Dip the end of a banana in the melted chocolate mixture, and then sprinkle with the granola crumbles. Set aside and repeat with remaining bananas. Fill with the peanut butter, serve and enjoy! 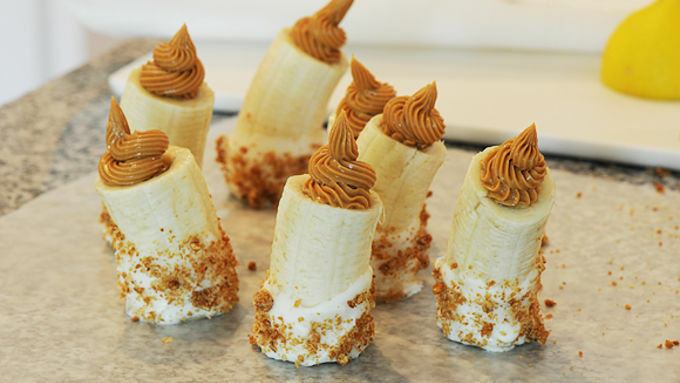 Bananas with granola, PB and white chocolate are enough to make you want to hike! Do you ever go hiking just for that really, really good trail mix? I have. My favorite contains banana chips, peanut butter, granola, and white chocolate. My trail mix triumvirate was on my mind when I saw these cute banana snacks, and subsequently customized in to my own little creation -- Trail Mix Banana Bites. 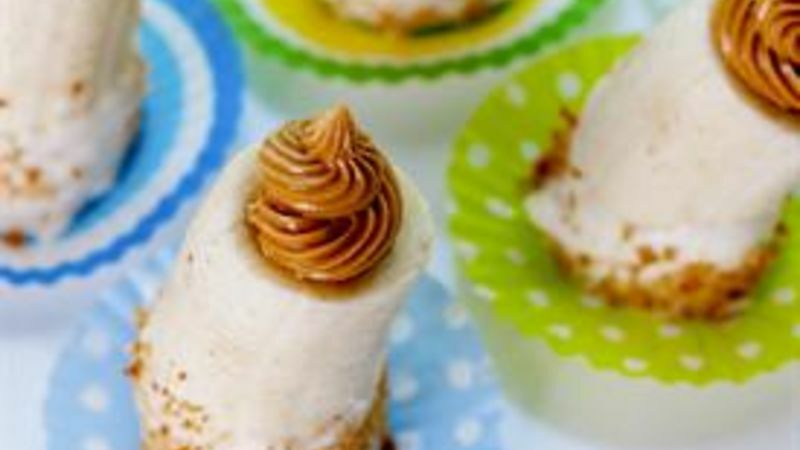 And they’re dual-purpose -- a perfect snack for the kiddos, as well as a fun and easy, edible project for same! 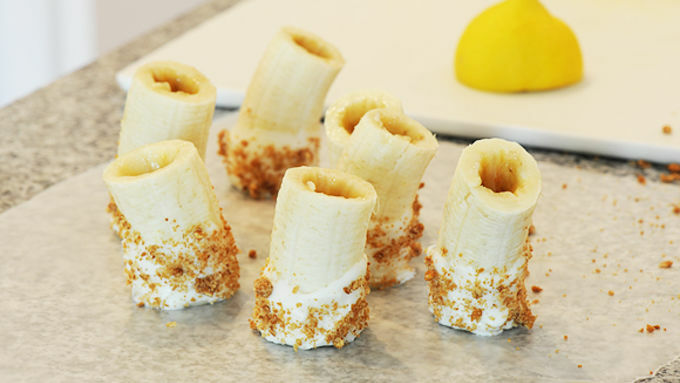 You’ll need banana sections – if you can find bananas that aren’t very curvy, that’s ideal. I ran the tops of my bananas over a cut lemon, to prevent browning, as they had to sit pretty for the photos. I used Nature Valley™ Granola bars, crumbled, for the granola portion of the snacks. I didn’t even remove the granola bars from the package, just gently crushed with a rolling pin and poured into a small container for dipping. Gently is the operative word here, though. Unnecessary roughness could lead to a granola bomb …. The peanut butter is basically ready to go – put it a bag with a pastry tip if you’re feeling fancy. But you could also use a small spoon. Serve and enjoy!